Dr. Storozynsky takes care of patients with advanced heart failure, patients with heart transplants and artificial hearts (VAD). His area of special interest includes researching novel non-invasive echocardiographic techniques to detect subclinical organ rejection., performing diagnostic right heart catheterizations, surveillance endomyocardial biopsies, and management of patients with endstage cardiomyopathies requiring mechanical left ventricular assist devices. 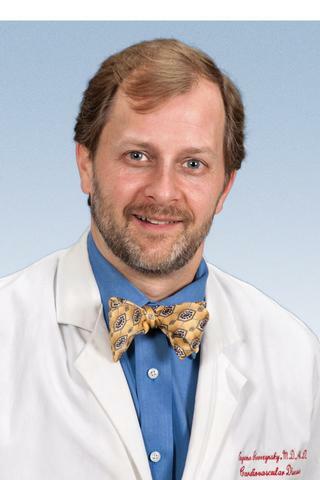 Dr. Storozynsky is also Director of the Cardio-Oncology clinic where he specializes in patients with cardiac complications of cancer and cancer therapy. He is board certified in Internal Medicine and Cardiovascular Disease. Dr. Storozynsky obtained his MD from the University of Rochester School of Medicine and Dentistry. He completed his Internal Medicine residency and cardiovascular disease fellowships at the Unviersity of Rochester Medical Center. He joined the faculty in 2006 and is a member of the Heart Failure/Heart Transplantation Program at the University of Rochester. Assistant Professor of Medicine and Cardiology at the University of Rochester Medical Center. Dr. Storozynsky is Board Certified in Internal Medicine and Board Certified in Cardiovascular Diseases. His area of special interest includes researching novel non-invasive echocardiographic techniques to detect subclinical organ rejection. Ph.D. in Microbiology and Immunology and Medical degree, University of Rochester. Residency and Cardiology Fellowship, Strong Memorial Hospital, University of Rochester.